Author of Killing Penelope, A daughter’s memoir of failed rescues. Killing Penelope is a true story about a girl’s devotion to her mother, Penelope, a wild and eccentric woman who never intended to have a child, and to her father, Gardiner, a Harvard-educated physician whom the child depended upon to be the steady, stable parent. Penelope did not wear dresses and heels like other mothers of the 1960s. She wore Levi’s and men’s shirts, and she held a shotgun with more comfort than she held her baby girl. Penelope loved Gardiner but not enough to give up her Swiss lover, Helene. Kimball was eight when Penelope developed a life-threatening illness, which left her emaciated, drug-addicted, and mentally unstable. When Gardiner abruptly left the family, Penelope gathered her strength and told Kimball they were going to start a new life. Kimball was twelve when they packed up the Porsche, dogs, parakeets, and bags of narcotics, and left the only home she had ever known. Kimball’s early teen years were frightening and unpredictable as she desperately tried to save Penelope, who succumbed to addiction, depression, and recurring bouts of illness. In this memoir by Kimball Converse Pier, the author gives a beautiful portrayal of her experience of retrieving humor, grace, and gratitude from the rubble of despair and loss. 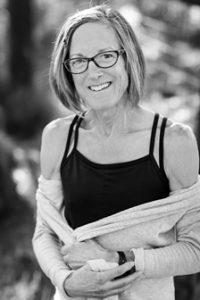 Kimball Converse Pier, Ph.D. is a depth psychologist and psychotherapist who lives and practices in Truckee, California. She lives with her husband, Jon L. Weedn, and their two miniature Dachshunds, Penny and Ruthie. She has two grown children, a daughter who is a social worker, and a son who loves anything to do with a board (snow, surf or skate).